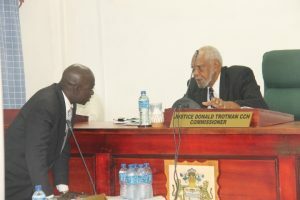 Attorney-at-Law for the Lindo Creek Commission of Inquiry, Patrice Henry (left) speaking with Inquiry Commissioner, Retired Justice Donald Trotman. A number of then Guyana Defence Force (GDF) soldiers, who are persons of interest for the Lindo Creek massacre 11 years ago, are unlikely to testify because they are no longer serving members of the army. However, the GDF said it has made arrangements for those, who are still employed in the army, to be interviewed by the Inquiry Commissioner, Retired Justice Donald Trotman. “The Force has since responded, indicating the availability of the requested ranks, as some are no longer in its employ. Further, an agreement has been reached for those available ranks to report to the Commission of Inquiry for a preliminary interview on Wed 18-04-18 at 11:30 hours,” the GDF said in its statement. Head of the Guyana Police Force’s Office of Professional Responsibility, Retired Assistant Commissioner Heeralall Mackanlall has already told the Inquiry that he had been unable to eliminate or implicate the Joint Services in the Lindo Creek massacre. Mackanlall, who had been tasked by Greene to probe allegations that the Joint Services had been responsible for the death of the eight miners, had also obtained statements from a number of soldiers. The GDF said the Lindo Creek Commission of Inquiry has requested that a number of ranks be made available to appear before the Commission. So far, former Police Commissioner Seelall Persaud and Assistant Police Commissioner, Clifton Hicken have denied going to Lindo Creek in June 2008 when eight gold miners were burnt. Persaud and Hicken have told the Commission of Inquiry under oath that they had travelled as far as Christmas Falls, Upper Berbice River and had engaged in a shootout with several heavily armed men, including Rondell ‘Fineman’ Rawlins, based on instructions they had received from then Police Commissioner, Henry Greene. They have also told the Inquiry that after the shootout, which left one of the men dead, they had been instructed by Greene to return to Georgetown and the Joint Services would be deployed. Dead are Dax Arokium, his brother Cedric and workers- Compton Speirs, Horace Drakes, Clifton Wong, Lancelot Lee, Bonny Harry and Nigel Torres.